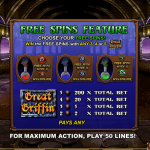 Great Griffin is the ultimate addition to the large Microgaming portfolio. Maybe you are not so familiar with the Greek and Persian mythology to know what a Griffin is but you can still enjoy this slot. And, to answer your question, in case you were wondering, it is a creature with a head and wings of an eagle and the body of a lion. So you guessed we have a powerful slot in front of us. 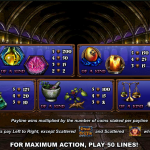 The theme of the game is mainly focused around magic and sorcery and gives us an insight in the occult. The true power of Great Griffin is seen in its special features department. All in all we have 3 special symbols that are keys to some features or winnings. First we have a flying Griffin which acts as a wild, then we have a Great Griffin scatter and the hooded lady which is a bonus symbol. The main feature is the free spins round. To activate the feature you need to land at least 3 scatter symbols and you can choose the number of free spins you want. You have a choice between 15 free spins with x 3 multiplier, 10 free spins with x 5 multiplier and 5 spins with x 10 multiplier. The Pick Me Bonus is a small addition to this game where every time you land 3 of the Lady symbols on the second, third and the fourth reel, you need to pick one symbol for an award. 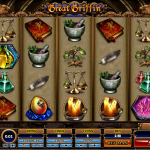 Microgaming is the name behind some of the best games in the Online Casino Industry and Great Griffin is among them too. This is a very unique and fun to play slot. There are a couple of special features that will make your experience more lucrative as well. For one of the all time classics consider playing Hot Shot a 5 reel slot by MicroGaming.